Ekhlassi, Ahmad, Rafati, Amirhossein. (1394). Facade Tectonics in Traditional Houses of Shiraz, Iran, Case Study: Zinat-al-Molk House. معماری و شهرسازی آرمان شهر, 8(14), 1-11. Ahmad Ekhlassi; Amirhossein Rafati. "Facade Tectonics in Traditional Houses of Shiraz, Iran, Case Study: Zinat-al-Molk House". معماری و شهرسازی آرمان شهر, 8, 14, 1394, 1-11. Ekhlassi, Ahmad, Rafati, Amirhossein. (1394). 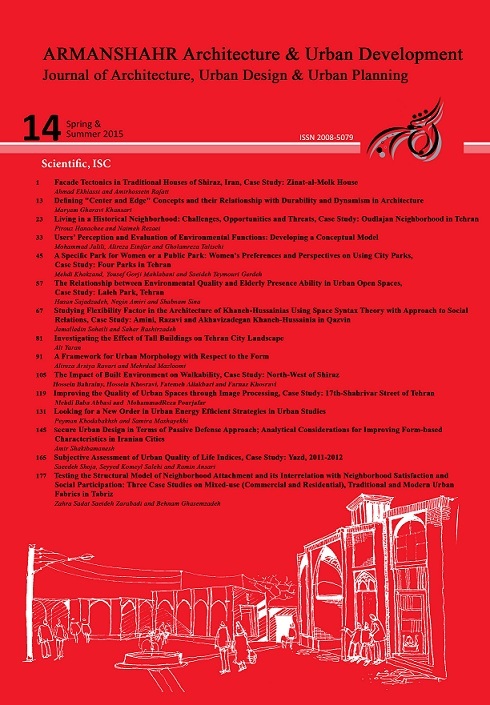 'Facade Tectonics in Traditional Houses of Shiraz, Iran, Case Study: Zinat-al-Molk House', معماری و شهرسازی آرمان شهر, 8(14), pp. 1-11. Ekhlassi, Ahmad, Rafati, Amirhossein. Facade Tectonics in Traditional Houses of Shiraz, Iran, Case Study: Zinat-al-Molk House. معماری و شهرسازی آرمان شهر, 1394; 8(14): 1-11. 1Assistant Professor of Architecture, School of Architecture & Environmental Design, Iran University of Science and Technology, Tehran, Iran. 2M.A. in Architecture Technology, Instructor at Iran University of Science and Technology, Tehran, Iran. -Alipour, N. (2011). The Study of Orosis in Qajari Palaces in Tehran. Negareh Journal, (18), 5-21. Persian Houses, Studied Case: Rasoulian House in Yazd, Iran. Islamic Arts Studies Bi-annual, (13), 55-68. Application to our Present Way of Building (H. Hübsch, Ed. ), in what Style should we Build? The German Debate on Architectural Style. Santa Monica, CA: Getty Center for the History of Art and the Humanities. -Conrads, l. (1970). Programs and Manifestos on 20th Century Architecture. Cambridge, MA: MIT. -De Botton, A. (writer) (2006). The Perfect Home [Documentary]. Britain: Seneca productions. -Frampton, K. (1983). Towards a Critical Regionalism: Six Points for an Architecture of Resistance (H. Foster,Ed. ), the Anti-Aesthetic; Essays on Postmodern Culture.Seattle: Bay Press. -Frampton, K. (1995). Studies in Tectonic Culture: The Poetics of Construction in Nineteenth and Twentieth Century Architecture (J. Cava, Ed.). Cambridge, MA: MitPress. -Frampton, K. (2002). Botticher, Semper and the Tectonic: Core Form and Art Form, In what is Architecture?. London and New York: Routledge. -Grote, L. & Wang, D. (2002). Architectural Research Methods (A. Eynifar, Trans.). Tehran: Tehran University. Memarian, G. H. (2006). An Introduction to Iranian Residential Architecture (Introvert Types) (4th Ed.). the Society of Architectural Historians, (3), 267-280. Comp.). Tehran: Cultural Heritage, Handcrafts and Tourism Organization. - Ricoeur, P. (1961). Universal Civilization and National Cultures, History and Truth. (C. A. KelbleyTrans.) Evanston: Northwestern University Press. -Zarei, H. (2010). Analysis of Architectural Style in Shiraz Qajari Houses. The Congress of Iranian Contemporary Architecture and Urban Design, Islamic Azad university of Beyza.